Roger Deutsch is the Green Bay-born, Budapest-based filmmaker who begun his almost four-decade-long career as a producer of Ulli Lommel's Blank Generation (1980) starring Andy Warhol and made his narrative debut feature Suor Sorriso (2001) - a surreal, anachronistic, tragically underseen fictional account on The Singing Nun - in Italy. More than a decade later, with a number of excellent short experiments - ranging from 'found' material collages to peculiar documentaries - up his sleeve, he arms himself with sharp-witted self-irony or rather, self-subversion and delivers a mighty fine sophomore flick. Referring to Ricercare - a travelogue of sorts wherein Deutsch reflects on his first experiences in Hungary - The Boy and the Train plays out as an accomplished piece of metafiction blending the elements of drama, comedy, (faux) autobiography and road-movie into a satisfying whole. It opens in a sparsely populated cinema - an image which the arthouse aficionados are sure to recognize and find sourly funny - and follows the author's namesake alter ego on a countryside trip he will never forget. An awkward chit-chat between the aforementioned protagonists turns into a suspenseful journey replete with existential uncertainty, subtle humor of varying kinds, philosophical curlicues and small-time cultural clashes caused by a language barrier. Most of the story's weight falls on Eckhouse's and Tóth's shoulders and they both prove to be up to their task, as previously suggested, giving us believable characters. 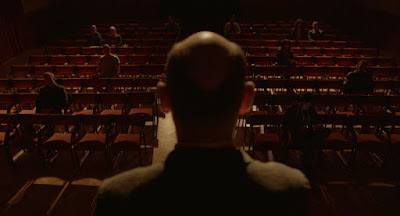 Through their (well-written) dialogue, as well as the weird encounters with the locals, the one with a delusional woman, Kata (the delightful Anna Herczenik), providing the most emotionally potent scene, we realize that Deutsch contemplates on the nature of creation and its relation to the creator, inter alia. Every now and then, he slyly winks at the viewer, reminding us that what we are watching is a figment of his imagination, yet he imbues it with raw sincerity, marrying European sensibility to American indie minimalism. Thanks to the authentic locations captured in natural light by the keen eye of András Gravi Kiss, he establishes an intimate and, to a certain degree, melancholic atmosphere complemented by diegetic sound and Gábor Holtai's evocative score. And let's not forget a witty homage to E.A. Poe's The Cask of Amontillado which puts 'the fake' Roger in a heightened state of alert and an extra smile or two on our face.